A beautiful, highly visual and inspiring collaboration of circus, puppetry and theatre. In a world where people are constantly glued to their phones follow an individual who dares to look up and find joy in taking the time to appreciate the beautiful nature that surrounds them. Look Up is a celebration of what we can see if we step outside of our everyday lives, and embrace the beauty that surrounds us. 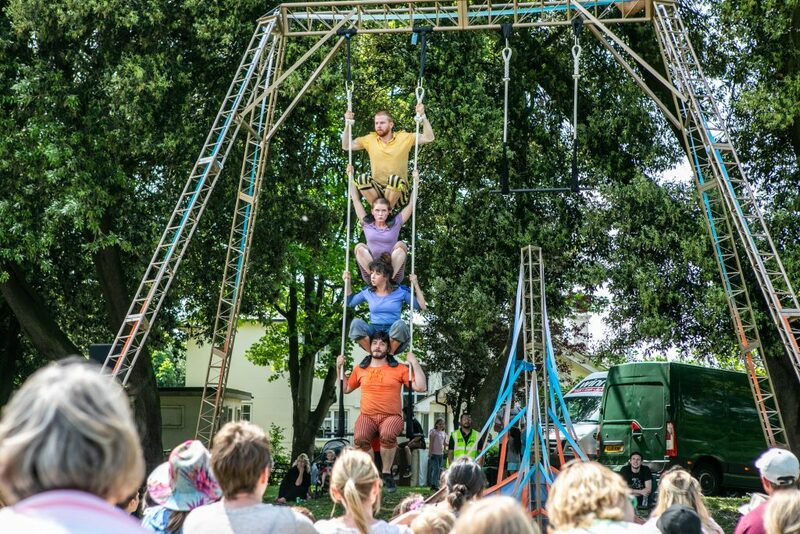 Look Up takes place on in and around a self-supported custom-made aerial rig and explores the relationship between circus performer, puppet and audience. The show is a celebration of what we can see if we step outside of our everyday lives, and embrace the world around us. In a world where people are constantly glued to their phones, our protagonist finds joy in taking the time to appreciate the beautiful nature that surrounds them. Playful puppetry is weaved with daring circus that interacts with the audience and makes them physically look up and away from their phones. Hikapee explores the relationship between circus and theatre to create imaginative storytelling performances for families. The company was founded in 2014 by Edd Casey and Bryony Livesey. Co-commissioned by Without Walls, Brighton Festival, Out There International Festival of Circus and Street Arts and Theatre Delicatessen. With support from 101 Outdoor Arts Creation Space and SeaChange Arts.